iPad 9.7/9.7 Pro/5th Generation/6th Generation "2018"
Protection with a convenient removable strap and a folding handle that acts as a stand. This durable yet lightweight rubber iPad case protects the iPad and allows for easy positioning and carrying. It's perfect for people with upper extremity weakness, those using their iPad as a communication device, busy teachers and parents, and therapists that use their iPad for therapy. Carrying handle flips so iPad can be angled at a slant for typing or stand upright for viewing. The 1 1/2" wide removable carry strap adjusts from 30" to 45" and has a soft shoulder pad. It can be used cross-body or around the back of the neck. 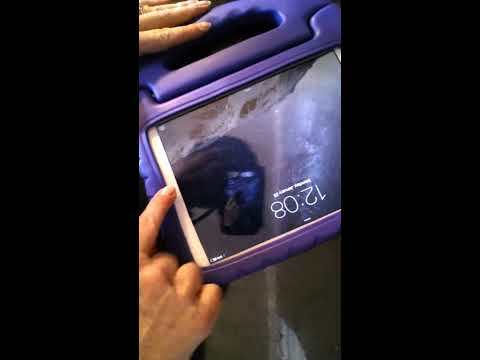 The iPad handle flips the screen up so it can be accessed while the case is still being worn. Perfect for augmentative communication users or individuals that use their iPad for visual schedules. You'll have access to all buttons, ports, cameras and the speaker. (iPad not included) Style may vary slightly from that shown. Mini and Air/Air2 cases weigh 8 oz, other cases weigh 10 oz. If you choose not to purchase the strap, the strap mounting hardware will not be included. Unlike some other company's cases, our Rubber iPad Case with Strap is a dense protective rubber that does not allow the iPad to be easily removed by the user, making it more difficult for individuals to remove the iPad from the case when they are not supposed to. Because the case is a dense rubber, there's a little work involved when inserting the iPad into the case. See our video. Protect the iPad screen with an optional Shatterproof Screen Protector*. Perfect for individuals who tend to be rougher with their iPad. This Shatterproof Screen Protector isn't just a regular old plastic sheet. It is a special polycarbonate material with a lifetime warranty. View the video on the product's page to see just how durable this protector really is! You will be amazed! *For Shatterproof Screen Protector installation instructions, please click here. *Be sure to register your Shatterproof Screen Protector as instructed on the packaging. This registration is necessary to activate your lifetime warranty through the manufacturer. The Shatterproof Screen Protector is only returnable to Adaptive Tech Solutions if it is in new, resellable condition. Warranty replacements should be completed through the manufacturer. This is a smart investment to go along with the Rubber iPad Carrying Case with Strap.